Brentwood, TN – For the second time in as many weeks, junior pole vaulter Savannah Amato has been named adidas® Ohio Valley Conference Field Athlete of the Week. 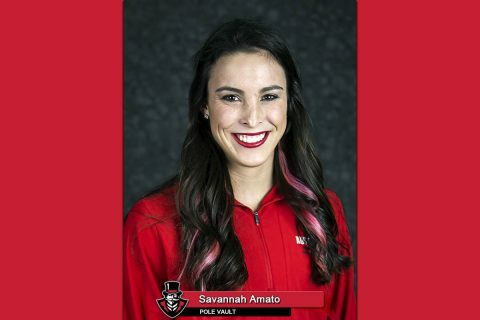 Amato placed sixth at the prestigious Florida Relays last week, posting a 3.95m (12-11.50) mark to maintain her stranglehold on the top spot in the league as the season enters its final stretch. The Delaware, Ohio native ranks 24th in the NCAA East region and is tied for 47th nationally in the pole vault. Amato becomes the first Gov since Kaylnn Pitts in 2015 to earn honors in back-to-back weeks from the conference office. Overall, she’s been named OVC Field Athlete of the Week four times this season and seven times in her Austin Peay career.